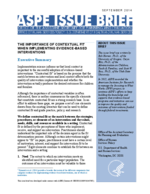 The purpose of this issue brief is to propose an expanded role for “contextual fit” in the implementation of evidence-based interventions across education and human services domains, including mental health, juvenile justice, child welfare, and residential supports. The burgeoning field of “implementation science” speaks to the important role of contextual fit in the implementation process (Blase & Fixsen, 2013; Fixsen et al., 2005). Our basic premise is that contextual fit is important for (a) selecting evidence-based interventions, (b) the initial implementation of evidence-based interventions, and (c) the ongoing adaptation and scaling of evidence-based interventions. Appreciation of the contribution of contextual fit is not new, but for this appreciation to influence common practice, we need an operational definition of contextual fit, formal measures of contextual fit, and systematic research that guides both policy and practice.